21-Sep-2002 -- Our journey to 50N, 115W (Photo 1) began in Calgary early on a Saturday morning around 8:00am. Expecting to reach the confluence point (CP) late in the day, Kirk and I loaded up the truck with food and equipment to camp overnight. Based on the topo maps and landsat images we examined there was a trail of some kind passing within 1km of the CP. We were planning to drive as far as we could, then switch to mountain bikes when the road became poor, and finally ditch the bikes and hike the rest of the way through the bush. We had a plan. Heading south on highway 22, we drove along the foothills of the Rocky Mountains passing through rolling pasture and hay fields and made a stop in the small village of Longview just after 9:00am to grab a snack. You can get some of the world’s best beef jerky in Longview. Continuing southward, we passed giant wind powered generators turning slowly in the winds funnelling through the Crowsnest Pass. As we turned west onto highway 3, we began heading into the mountains and stopped for gas at the town of Frank in the shadow of Turtle Mountain (Photo 2). On April 29, 1903, at 4:10 am, 30 million cubic metres of limestone slid from the summit of Turtle Mountain and buried a portion of the sleeping town of Frank ( more information). Back on the road, and having traveled about 220km from Calgary, we climbed over the continental divide and passed from Alberta into British Columbia via the Crowsnest Pass at 1396m ASL. Just before reaching the town of Sparwood, we turned north onto highway 43 and began our journey into the Elk Valley. The Elk Valley got its name after early explorers often saw large herds of elk. Unique in North America, this valley is able to support significant populations of big game animals. Elk are most common, but you will also see mule and white-tailed deer, black bears and bighorn sheep. Venturing farther away from civilization, you will find mountain goats, moose, wolves and grizzly bears. This spectacular valley was essentially unsettled until the Canadian Pacific Railway put a line through the Crowsnest Pass in 1898. The mountains flanking this valley are known for their significant coal deposits and once the railway came through, people began moving into the area. Following the Elk River up the valley, we approached the southern edge of the town of Elkford. At this point we started to approach the location of Kirk’s previous attempt at this CP. There are numerous mining and logging roads that head up the sides of the valley and we needed to find the one leading west of the town site that would take us near the CP. Unfortunately most of these roads were too new to appear on our topo maps. Our GPS showed us that we were approximately 5.5km west of the CP so we started driving up a rough logging road that appeared to be heading in the right direction. Soon it became clear that this road was not going to get us over a small ridge separating us from the side valley we wanted so we swallowed our explorer's pride and decided to ask for directions. Fortunately there was a fellow working at collecting some firewood not to far from us and he turned out to be very familiar with the area. He indicated that the road we wanted was likely a cross-country skiing trail heading out the west side of town "just past the old school – on the way to the ski hill". We thanked him and proceeded to drive back down through the town. A quick check on the map outside of the closed visitor’s information centre/chamber of commerce/tanning salon confirmed our route to this skiing trial. Having traveled about 290km to Elkford, and realizing that we were closing in on our target, we started to get excited! On our way through the quiet town to the trial head, we stopped to take a picture of the deer (Photo 3) grazing on someone’s front lawn. Elkford prides itself on being the "Wilderness Capital of BC" and at 1300m ASL, the highest community in BC as well. At 12:30pm we found the trial head (Photo 4) without too much trouble and began preparing for the mountain biking stage and hiking that was sure to follow. The GPS indicated that we were about 4.8km northwest of the CP as we began biking on a fairly good, but steep, trail up the valley along Boivin Creek. Although it was clear and sunny with a temperature of about 14C, we found it pretty frosty along some of the shady parts of the trial. As we rode deeper into the forest, we had to keep in mind that we were heading into bear country during the season when bears are actively feeding before going into winter hibernation. Armed with a bear banger and some bear awareness(PDF document), we continued up the trail watching for signs of bears and yelling and babbling to each other like a couple of idiots. One of the best ways to avoid bears is to make lots of human noise so that they know you are coming and will try and avoid you. After biking for about 1.5 hours and 5km on the trail our GPS (Photo 5) indicated that we were at the closest approach to our target – the CP lay about 475m to the west. Hiding our bikes in the trees just off the trial, we set off on foot for the hike through the rather dense bush. Despite the obscured view of the sky, our GPS functioned well and allowed us to record our track through the forest as we crossed the creek (Photo 6) and proceeded to climb up the opposite side of the valley. We scrambled up the valley wall and eventually came upon an open area, mostly cleared of trees and brush due to snow avalanches, as was predicted by our landsat images. This made the last 50m of hiking to locate the precise CP almost easy, despite having to navigate on a fairly steep mountainside. At about 3:20pm we triumphantly declared that we had found our CP of 50N, 115W, 1702m ASL (Photo 7). After having a good look around, we both agreed that this was the best setting for a CP, at least in Canada – perhaps even the world (Photos 8-11). We sat down in the sunshine, gazed out over the valley, and ate a snack. Prior to leaving, we decided that this site deserved some small monument - a fitting tribute to this great day. 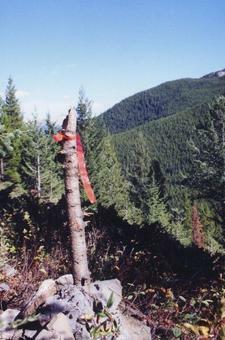 So we piled up some limestone rocks around a small bit of branch and affixed an orange ribbon indicating our names, the date and location. The trip back to the bikes was quick, being aided by our GPS track and the fact that it was mostly downhill. The return bike ride to the truck was similarly speedy and we arrived at the trial head at 4:05pm. Seeing that we had made such good time, we decided to skip setting up camp for an overnight stay, and drive back to Calgary that evening instead. As we retraced our route back to Calgary, the sun slowly set behind the Rocky Mountains. Content with the memories of our successful CP trek, we finally did see some bears that day. Just south of Longview we spotted a mother black bear and her 2 cubs playfully running along the edge of a grove of trees beside the highway. We arrived back in Calgary at about 8:00pm that evening, after a full 12 hours/600km of adventure – and a great day that will never be forgotten.